Utagawa Kunisada/Toyokuni III (1786-1865) Narukami the Thunder God, 1851. Oban diptych. 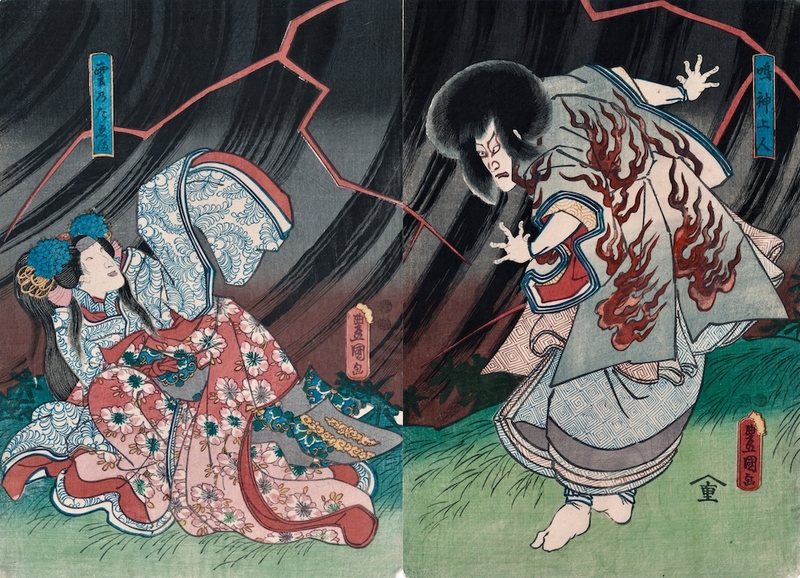 A fantastic, true diptych print by Kunisada from 1851. The print shows the performance of the kabuki drama of Narukami the Thunder God. Narukami lives in a hermitage near a waterfall in which he has has imprisoned the dragon god. The rainfall has ceased and the land is suffering from drought. The Emperor sends the beautiful Princess Taema to try and break the curse and restore rainfall to the land. As she approaches the hermitage she meets some of Narukami's acolytes, Hakuunbô (the white cloud bonze) and Kokuunbô (the black cloud bonze), who immediately fall under the spell of her beauty. She claims to have come to pray for the soul of her late husband and to wash one of his garments since there is no water in the capital. The acolytes and Narukami listen entranced as she goes into intimate and sensuous detail about how she met her husband and how they made love. Narukami feels faint from listening to the story and falls off the veranda of his room. Princess Taema revives him by transferring water from her lips to his, but he becomes immediately suspicious as he knows of a hermit who lost his powers of sorcery in a similar fashion. She pleads her sincerity and asks to become his disciple. He agrees and sends the acolytes down the mountain for nuns' garments and a razor. While the acolytes are gone Princess Taema feigns illness, and naïve Narukami offers to massage her pain. However, he has to put his hand inside her kimono and when his hand touches her breast he is overcome with desire. She has been waiting for this to happen and begins to ply him with wine - the first alcohol of his life. Very soon the wine loosens his tongue and he reveals that the dragon god remains imprisoned as long as the sacred rope across the waterfall is intact. When Narukami falls into a drunken stupor, Princess Taema creeps away and cuts the rope. She escapes as thunder and lightning fill the sky and rain pours down. When Narukami revives, his anger at being tricked transforms him into a thunder god and we see him in a final pose wearing a costume covered in orange-red flames and glaring in the direction his seductress has fled. The print shows the final scene of Narumkami’s rage. Colour, condition and impression are all very fine; a truly great and very rare diptych. Oxidation to the flames on the robe. This print appears on the front page of the outstanding website kabuki21.